Easter weekend is quickly approaching and I’m so excited. My son has a long holiday weekend, and my husband will be taking a little time off too. Time with family is so important to us. But instead of going on any adventures this long holiday weekend, we’ll be doing a little resting and relaxation poolside in the backyard, that is when we’re not hunting after Easter eggs! I was just making my grocery list for this weekend. I’m going to keep things pretty simple. I’m making a ham along with a few salads that I’ll make ahead on Saturday afternoon. That way we’ll have lots of time to decorate Easter eggs and relax on Sunday. 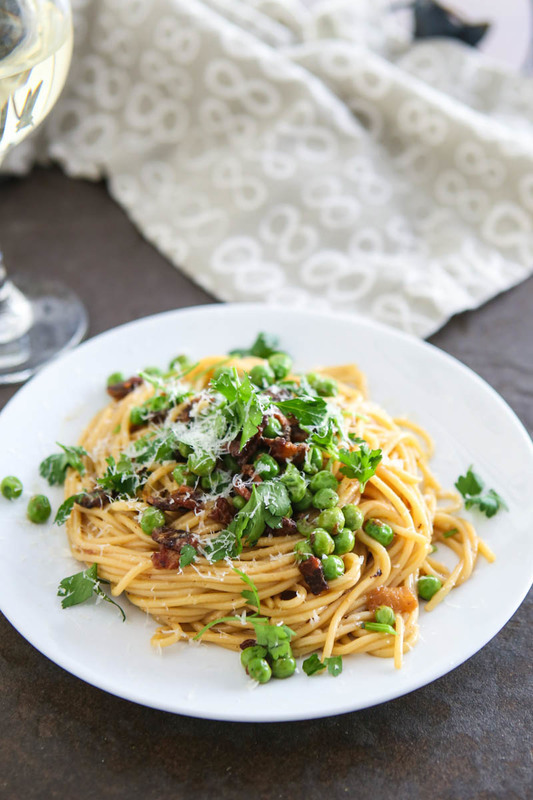 But tonight I need something pretty simple, that’s why I’m going to make one of my favorite quick and easy pasta dinners, bacon and pea carbonara. This is the perfect easy weeknight dinner for those hectic weeknights. For this recipe I used a nice high quality thick cut bacon. My brand of choice is Wright® Brand bacon. In this recipe I used Wright® Brand Naturally Smoked Apple Wood Bacon. 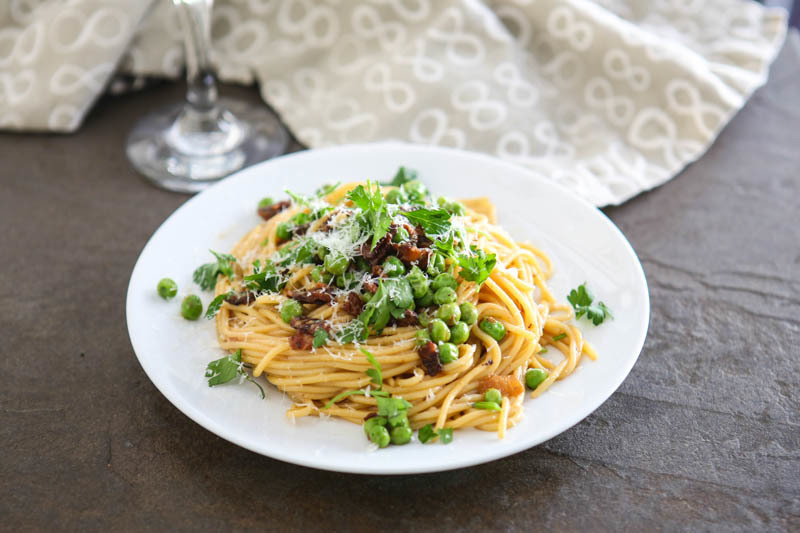 The apple and smoky flavor in the bacon pairs wonderfully in this recipe with the garlic, peas and white wine. Wright® Brand Naturally Hickory Smoked Bacon would also work nicely in this recipe. I always have a package of that one on hand because it’s our breakfast bacon. 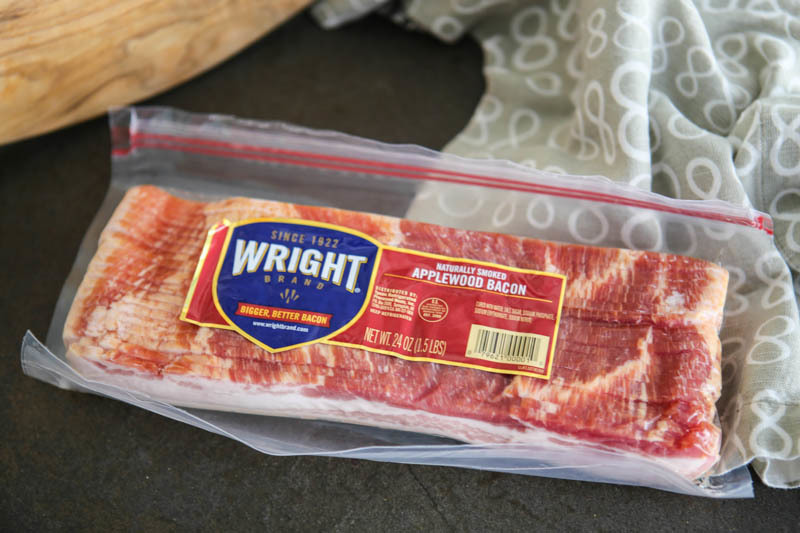 Wright® Brand bacon is a thick, hand-crafted bacon, expertly smoked for exceptional flavor. When they make this bacon, they use the best cuts of premium meat that is then hand selected and hand-trimmed. Smokemasters craft the perfect smoky flavor that’s in every hearty slice of this premium bacon. I got a great deal on my Wright® Brand bacon at Publix. You can save $2.00 INSTANTLY on Wright® Brand Bacon at any Publix. From 3/17 – 3/28 ONLY Wright® Brand Bacon will be $7.99 instead of $9.99! 1. Add chopped bacon to a large skillet. Cook for about 10 minutes over medium low heat, and then add chopped onions and garlic. Continue to cook until bacon renders it's fat and is crisp. 2. While bacon is cooking, cook pasta according to package directions. After bacon is done, pour off excess bacon drippings. 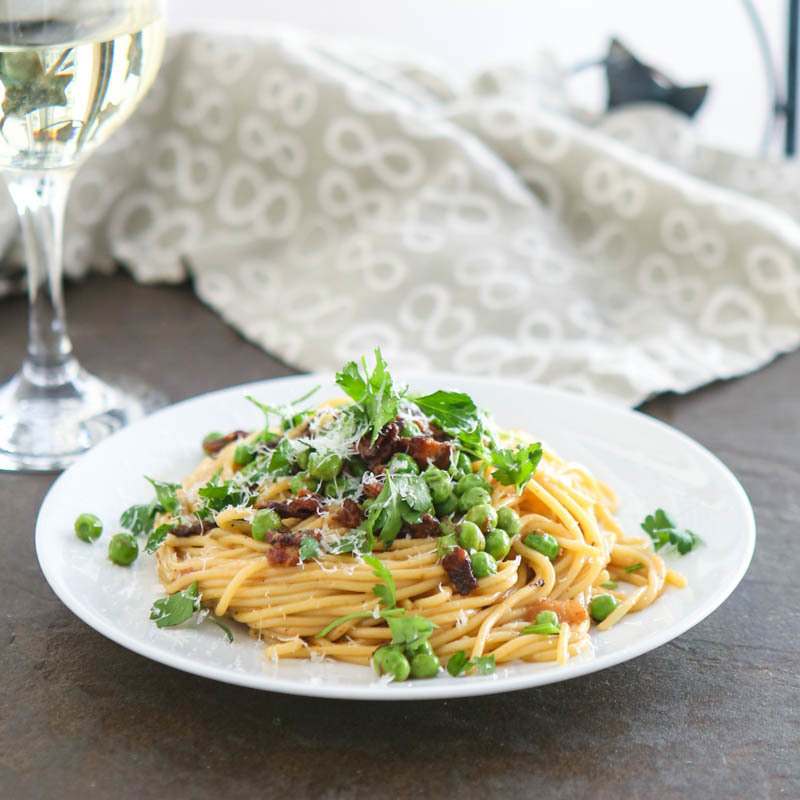 Add white wine and peas to skillet with bacon and the onions. Bring to a boil and reduce to a simmer. 3. Add eggs to a large bowl and whisk. Temper the eggs by adding a little of the hot wine mixture at a time to the eggs, whisking constantly until you've added all the wine and bacon mixture. Combine this with the pasta and Parmesan. Toss well to coat. The heat from the pasta will cook the eggs and melt the cheese. 4. Serve garnished with fresh Parsley. Be sure to follow Wright Brand Bacon on Twitter and Wright Brand Bacon on Facebook too!